I’ve done it, you know you’ve done it and that’s because it’s such an easy thing to do, but iBetterCharge has got your back. Your iPhone or iPad sits in your bag or on your desk, unplugged and not charging. Not a big deal, until you realize late in the day and right before you head out for the night, that you’ve got less that 20 percent of battery life left and and several hours ahead before you can charge your phone. iBetterCharge uses iTunes Wi-Fi syncing to keep its finger on the pulse of your iOS device’s battery. You have four options for setting notification thresholds for the app. 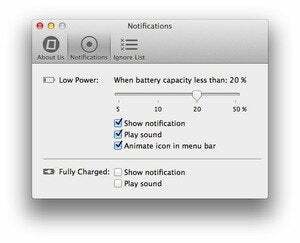 When your battery reaches 50, 20, 10, or 5 percent of its capacity you’ll receive a notification reminding you to plug your device in for a charge. 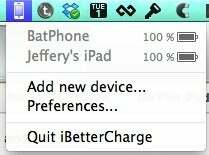 Simple, well designed, and oh so easy to use, iBetterCharge keeps tabs on your battery so you don’t have to.